Explosion rocks nuclear plant at Fukushima: Injuries, plumes of smoke, walls collapsed. Japan declared states of emergency for five nuclear reactors at two power plants after the units lost cooling ability in the aftermath of Friday’s powerful earthquake. March 13. Japan says second nuclear plant blast possible, but reactor will withstand blast as in the first explosion. The BradBlog is posting continuous updates from around the web. Opening this as a new article, picking up from the much UPDATED last one, as to the explosion at the Fukushima nuclear plant in Japan. Latest UPDATES, beginning with the EXPLOSION, now posted at bottom of this article. TOKYO (MarketWatch) — Smoke or steam was seen around Tokyo Electric Power Co.’s Fukushima Daiichi nuclear power plant Saturday, according to Japanese broadcaster NHK. 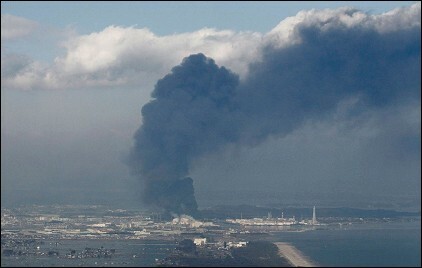 Several worders were reported injured at the plant, NHK said, adding that the exact cause of the emission was unknown. 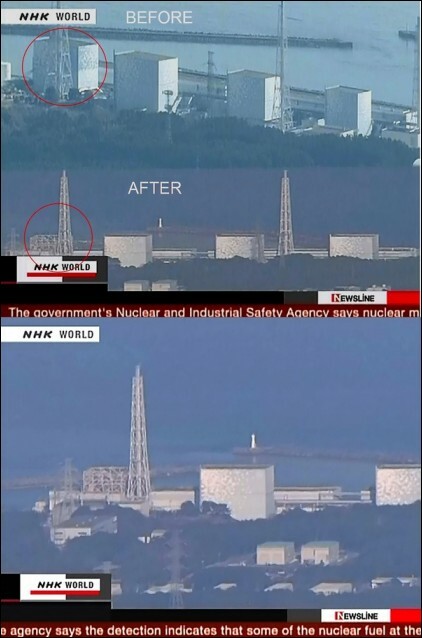 NHK reported an explosion was heard about 10 minutes before the white cloud appeared around the plant. Japanese media earlier Saturday warned that a meltdown was possible or may be already occurring at plant, after Friday’s 8.9-magnitude earthquake and tsunami struck Japan’s northeast coast and damaged the reactor’s cooling system. 3/12 2:05am PT: Better video and commentary now from BBC here, but it doesn’t seem to be embeddable, so you’ll have to go to the link to look at it. The hope is that because the nuclear process had been shut down — even as officials have been unable to properly cool the plant — the nuclear process is unlikely to have restarted. 3/12 2:12am PT: VOA’s Steve Herman, on the ground in Fukushima, says the evacuation radius around the plant has been expanded to 20km. It had originally been 3km, before being widened to 10km. And now 20km. A meltdown occurs when the control rods fail to contain the neutron emission and the heat levels inside the reactor thus rise to a point that the fuel itself melts, generally temperatures in excess of 1,000 degrees Fahrenheit, causing uncontrolled radiation-generating reactions and making approaching the reactor incredibly hazardous. A meltdown does not necessarily mean a nuclear disaster. As long as the reactor core, which is specifically designed to contain high levels of heat, pressure and radiation, remains intact, the melted fuel can be dealt with. If the core breaches but the containment facility built around the core remains intact, the melted fuel can still be dealt with — typically entombed within specialized concrete — but the cost and difficulty of such containment increases exponentially.However, the earthquake in Japan, in addition to damaging the ability of the control rods to regulate the fuel — and the reactor’s coolant system — appears to have damaged the containment facility, and the explosion almost certainly did. The explosion at the reactor is certain to rattle confidence in nuclear power in Japan, victim of the only nuclear weapon explosions and where people have long been sensitized to the dangers of radioactive releases. In the United States, it will deal a severe blow to advocates of a nuclear power renaissance. Of course, didn’t they also say the BP oil spill would “deal a severe blow to advocates” of off-shore drilling? 3/12 3:28am PT: Expert on Fox “News”, Joe Cirincione of Ploughshares Fund, when asked what makes this the “second worst nuclear disaster in history”, answers: “Three Miles Island never got to this phase. We’re much closer to meltdown than we were at Three Mile Island.” Goes on to compare to Chernobyl, like so many others late tonight. Blast was caused by accumulated hydrogen combined with oxygen in the space between container and outer structure. No damage to container. Until then, follow these folks who are on the ground near Fukushima: VOA’s @W7VOA, IDG’s @martyn_williams, WaPo’s @chicoharlan, AP’s @hiroko_nakamura. We’ve been updating this item all day and night — having started the earlier this afternoon — as events have developed…See bottom for latest updates through the EXPLOSION which has 3/12/11 1am PT. * * * This now deserves its own item — as I’ve feared it has since last night’s cryptic official comments — so I’ve broken off the UPDATES from the previous item, concerning the nuclear emergency declared at Fukushima in the wake of last night’s earthquake and tsunami in Japan to this item, dedicated to the nuke issues. We may be learning exactly that tonight, as radiation levels are reported to be 1000 times normal levels; “emergency” declarations now exist for two plants — Fukushima Daiichi plant on east coast, 200 miles north of Tokyo and the Fukushima Daiichi complex — with a total of five reactors said to be at risk; evacuations around the plants have been expanded to 10km; and, as one of the experts has said (and several others have concurred), “the possibility of some sort of core meltdown” exists. If there was nothing to worry about here, it seems that officials would be saying that over and over. They are not. So, the original UPDATES to the earlier item, and the additional ones we’ve added throughout the day, all follow below — with new UPDATES, and what seems to be the increasingly bad news, including two nuclear experts who have just appeared on Rachel Maddow moments ago saying the more they hear, the less assured they are that things are safe — all added to the bottom of the article, where we’ll continue to update as warranted. We’re also continue to tweet quick updates and links via: @TheBradBlog. Tokyo (CNN) — A mammoth earthquake and subsequent tsunami may have caused radioactive material to leak from an atomic power plant in northeast Japan, a major electric company said Saturday, according to a news agency report.Citing the Tokyo Electric Power Co., Japan’s Kyodo News Agency said that radioactive substances may have seeped out of the Fukushima Daiichi nuclear reactor, about 160 miles (260 kilometers) north of Tokyo. Earlier, the agency had reported that authorities may purposefully release radioactive vapor to alleviate pressure at the power plant. Radiation levels measured at a monitoring post near the plant’s main gate are more than eight times above normal, Japan’s nuclear safety agency said, according to Kyodo. The government said earlier that it was sending senior officials and the defense force’s Chemical Corps to the Fukushima power plant, according to the Kyodo News Agency. The same agency later reported that authorities may release some radioactive steam in order to alleviate pressure at the reactor. The IAEA, the international nuclear organization, said Friday that its officials are “in full response mode,” as they worked with Japanese authorities and monitor the situation. Using Air Force planes, the U.S. government has sent over coolant for the Fukushima plant, Secretary of State Hillary Clinton said Friday. James Acton, a physicist who examined the Kashiwazaki-Kariwa plant after a 2007 earthquake, told CNN that Japanese authorities are in a race to cool down the Fukushima reactor. “If they can’t restore power to the plant (and cool the reactor), then there’s the possibility of some sort of core meltdown,” he said. “If they can’t get adequate cooling to the core, it could be a Three Mile Island or worse,” said nuclear physicist Edwin Lyman of the Union of Concerned Scientists, which is working to improve the safety of nuclear power. The loss of coolant at the Three Mile Island Nuclear Generating Station in Pennsylvania for only 30 minutes led to a 50% meltdown of the core in that 1979 accident. Japanese authorities are venting radioactive steam into the air after the earthquake on Friday critically damaged a nuclear reactor at Fukushima Daiichi plant.The Japanese government on Friday declared a nuclear emergency at Tokyo Electric Power’s Fukushima Daiichi nuclear power station after the reactor’s cooling system failed. The government ordered thousands of people living within 6 miles of the plant to evacuate. Early Saturday, it declared a nuclear emergency at a second power plant where a cooling system had also failed. “It has the potential to be catastrophic,” said Robert Alvarez, a senior scholar at the Institute for Policy Studies in Washington, and a former senior policy adviser to the Energy Secretary during the Clinton administration. Chief Cabinet Secretary Yukio Edano said the amount of radioactivity in vapor would be “very small” and would not harm people or the environment. “With evacuation in place and the ocean-bound wind, we can ensure the safety,” he said at a news conference early Saturday. The venting may relieve some pressure and give workers more time to restore the emergency cooling systems. They have a 12- to 24-hour window, Alvarez said. “I don’t think the venting is going to result in a catastrophic release, but it’s definitely an indication that all is not well there,” he said. If the cooling is not restored quickly, the core can overheat, causing the water to boil over and exposing the core to air. The interior can catch fire and cause a meltdown, releasing nuclear material into the concrete containment dome that surrounds the reactor, Alvarez says. TOKYO — Japan declared states of emergency for five nuclear reactors at two power plants after the units lost cooling ability in the aftermath of Friday’s powerful earthquake. Thousands of residents were evacuated as workers struggled to get the reactors under control to prevent meltdowns.Operators at the Fukushima Daiichi plant’s Unit 1 scrambled ferociously to tamp down heat and pressure inside the reactor after the 8.9 magnitude quake and the tsunami that followed cut off electricity to the site and disabled emergency generators, knocking out the main cooling system. 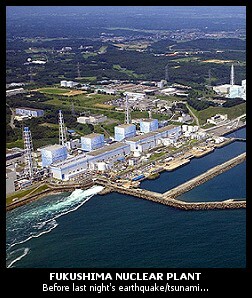 The government declared a state of emergency at the Daiichi unit – the first at a nuclear plant in Japan’s history. But hours later, the Tokyo Electric Power Co., which operates the six-reactor Daiichi site, announced that it had lost cooling ability at a second reactor there and three units at its nearby Fukushima Daini site. The government quickly declared states of emergency for those units, too, and thousands of residents near Fukushima Daini also were told to leave. “With evacuation in place and the ocean-bound wind, we can ensure the safety,” Edano said at a televised news conference early Saturday. It also was not immediately clear how closely the reactor had moved toward dangerous pressure or temperature levels. If temperatures were to keep rising to more than 2,000 degrees Fahrenheit, it could set off a chemical reaction that begins to embrittle the metallic zirconium that sheathes the radioactive uranium fuel. That reaction releases hydrogen, which can explode when cooling water finally floods back into the reactor. That was also concern for a time during the 1979 Three Mile Island accident in Pennsylvania. If the reactor temperature keeps reaches around 4,000 degrees, the fuel could melt outright, and the reactor could slump right into the bottom of the containment building in a partial meltdown. Then the crucial question would be whether the building would stay intact. “The last line of defense is that containment – and that’s got to hold,” Gundersen said. If it doesn’t, the radioactive load inside the reactor can pour out into the surroundings. One, perhaps, “positive” point in the AP article: “Mobile electricity supplies” have arrived at the Daiichi plant. Electricity, they say, it’s what’s needed now to cool down the reactors, presuming it’s not too late. Tokyo (CNN) — Reactors at two Japanese power plants can no longer cool radioactive substances, a government official said Saturday, adding that a small leak had been detected at one of the facilities.Atomic material has seeped out of one of the Fukushima Daiichi plant’s five nuclear reactors, about 160 miles (260 kilometers) north of Tokyo, said Kazuo Kodama, a spokesman for Japan’s nuclear regulatory agency. 9:07pm PT: Most recent announcement from IAEA on Fukushima is now 7 hours old. No newer news on 5 nuclear reactor emergencies, IAEA??? Venting air from reactor container suspendedThe operation at Fukushima No.1 plant to lower pressure of the containment vessel has been suspended due to high radiation levels at the site. The power station’s operator, Tokyo Electric Power Company, began to vent air from the reactor container at 9AM on Saturday. The Nuclear and Industrial Safety Agency says if radioactive substance is released in the air, safety of residents evacuated beyond a 10-kilometer radius from the No.1 reactor will be ensured. REMINDER: I’m able to cover more, quickly via Twitter. Follow here if you wish: @TheBradBlog. TOKYO — An official with Japan’s nuclear safety commission says that a meltdown at a nuclear power plant affected by the country’s massive earthquake is possible.Ryohei Shiomi said Saturday that officials were checking whether a meltdown had taken place at the Fukushima Daiichi power plant, which had lost cooling ability in the aftermath of Friday’s powerful earthquake. 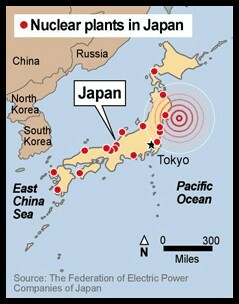 Shiomi said that even if there was a meltdown, it wouldn’t affect humans outside a six-mile (10-kilometer) radius. 10:46pm PT: IAEA finally offers fresh update. First in eight hours or so. Not much new info there, however, it seems. 11:34pm PT: Must stand down for the night (though may be able to tweet a bit longer at @TheBradBlog). Recommend you follow Steve Herman (@W7VOA), Voice of America’s Asian editor, whose just landed at Fukushima. He should have key reports from on the ground there. This entry was posted in Energy and tagged earthquake, japan, nuclear explosion, nuclear power plants, tsunami. Bookmark the permalink. What genius decided to build nuclear power plants on an island that sees 1,500 earthquakes a YEAR?!? The comparisons to Chernobyl are useless because Chernobyl was a lead pile, and these newer plants are Boiling Water reactors. The closer analogy is 3 Mile Island, which I remember all too well. Rady – you’re right of course, which genius do we all get to hang????? But they’ve done it here with Diablo Canyon in CA; Indian Point in upstate NY (though most of that has been decomissioned); and a few others around the US. The BIG question is: Are our idiot legislators going to continue to tout nukes as the way to get off of our oil habit, or are they going to finally get on the “green” train? We can all focus our energies on a safe resolution of this issue. Your participation in this visualization is your way of helping to create a safe outcome. Use your positive intentions and this visualization to see their nuclear system cooling safely. 1: Visualize water being pumped into the reactor. 2: See the rods in the reactor totally submerged in water. 3. Know that cooling is happening in an enclosed system. Please forward this to those you know who will want to be active participants in this global awareness issue. Gee, was this a government plot just like our own government taking down the Twin Towers on 9/11? Sanity: I am afraid that cynism and sarcasm is totally inappropriate at this time. Just my humble opinion, mind. As for the foregoing visialization, it can’t hurt, so why we all participate. Just remember that is those reactors go critical, we are ALL Japanese. Rady: You are most welcome. If I can add anything further, I will. Sorry – I couldn’t resist. I guess you could also say that Cody’s postings about 9/11 being an inside job are also totally inappropriate. But I doubt she would see it that way. No, I believe 9/11 was an inside job too. But this was a natural disaster no comparison. Again I didn’t mean anything personal, just I am so heartbroken for those people, and wish I could fly there right now and help and the statement hit me wrong. We could discuss 9/11 in another forum, no? Peace…. Really? How do you know that some government didn’t plant bombs inside the nuclear reactors and set them off to make the meltdown even worse than what would have resulted just from the earthquake? How do you know that this was how a nuclear reactor would typically react to a massive earthquake? Maybe the government wanted to put millions of its citizens into poverty? I’m sure you were heartbroken for the people who were in the WTC when some lunatics flew planes into the buildings but that didn’t stop you from coming up with a crazy theory about it being an inside job. Um, Sanity, you are so off the mark, why don’t you just sod off? Hey – it’s just as likely an inside job as 9/11. There’s no way those reactors should have reacted like that from an earthquake. One of the problems about nukes, both power and arsenals, is that after the peak of the no-nukes movement when USSR/US agreed to (allegedly) lower their stockpiles, generations of young people have NO IDEA what nukes are all about. That is the sad part…they know nothing, and I am not sure they will care. This could be the point where we all become toast…which side do you like to be buttered on? I was saddened on what had happened. Thank God, my relatives working in Japan are safe. I hope everybody has got on their feet after 2 years. I’m also glad that this is not another Chernobyl disaster.